Issue 294: The Legacy of Unicron! 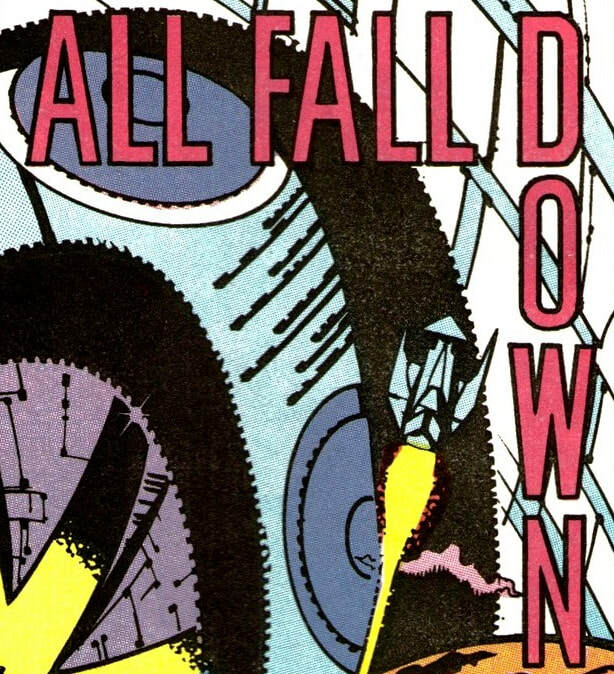 Part 5/All Fall Down Part 1*. 26th October 1990. Let’s give these Decepticons the welcome they deserve! *The arc concludes with the Matrix Quest branding removed once more. Here’s hoping everyone had a good Christmas and hasn’t been left as bloated as Unicron. And congratulations to the Christmas Quiz winner Colin Hicks, who has an array of amazing prizes heading his way in the new year. See the answers for yourself by following the COMMENT link at the bottom of the page. 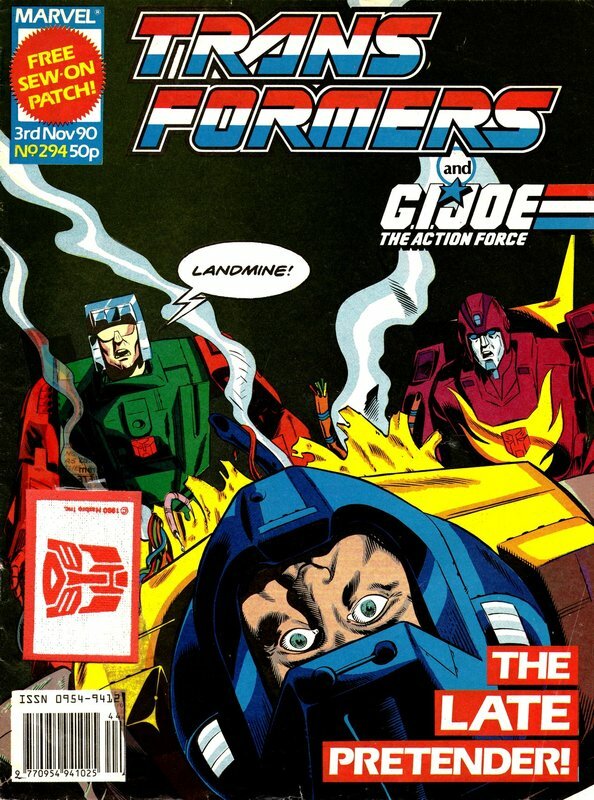 After a debatable example last week, we’re now really in to the era of the spoiler cover as Landmine’s death is put front and centre by Staz for the sake of a “Late Pretender” gag. Though it was amusing to read this the same week as Lost Light 12, which also has a massive fight in a shuttle bay and the death of a toy that no longer needs to be promoted that hasn’t featured for long enough that it’s easy to forget that they ever even existed in the first place. Luckily the issue comes with a sew on Autobrand patch that is both nifty and can be used to stitch up Landmine. What’s interesting about this week’s part of Legacy of Unicron!, is that Transformation makes a fuss out of the double page spread, which I don’t recall it doing the first time around. Presumably because it is now firmly the only one the UK stories ever did. Action Master Hook was not a successful new take on the Constructicon. Ironically, Unicron doesn’t appear directly in the story with his name, but does make it into the American story as we open with the end of the world. In this case the world Ghennix as the Chaos Bringer chews down on it. This is effectively cribbed from the Lithone sequence in the ’86 film, complete with one ship seeming to escape. That’s a sensible choice by Furman as American readers have not had any direct experience of the threat of Unicron yet (you can’t assume they’ve all seen the movie), so establishing exactly what he does to planets in advance of his attack on Cybertron is the right thing to do. It also serves to set things up for the next story as the fleeing ship doesn’t have Kranix on it, but three low life crooks. 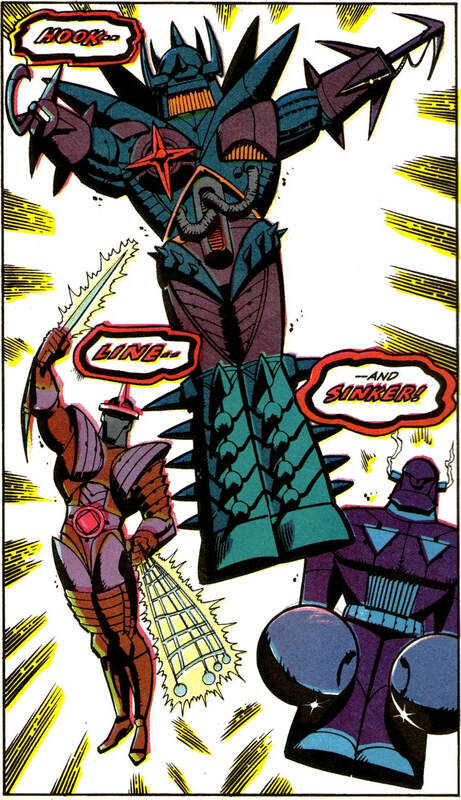 Which gives us another riff on the film as Unicron destroys their vessel and rebuilds their lifeless bodies in to three servants: Hook, Like and Sinker! His intent being that he’s worried about the Autobots preparations for his coming and has looked into his different futures to find a servant to send ahead. Even though he’s created three servants who could do the job for him. This is of course just a contrivance to get Galvatron into the American comic (his shadow appears in Unicron’s monitors), but if he now has the power to see every possible future that might result from the consequences of his actions, how can he possibly ever lose? We’ll see the timeline Galvatron is going to be grabbed from is one where Unicron wins, so why not just follow the actions he carries out in that to guarantee victory? As he sends the three stooges off through time and space (and having established he can do this, there’s a careful hand-wave for why he doesn’t just teleport to Cybertron, he’s too big. In retrospect this covers his kidnapping of Hot Rod, Kup and Blurr back in Target: 2006), he wonder if he doesn’t need to bother as he can sense the Matrix on the Ark and that it is evil. If only he had some way to see the future so he could know for sure. On the Ark is where things start to fall apart. 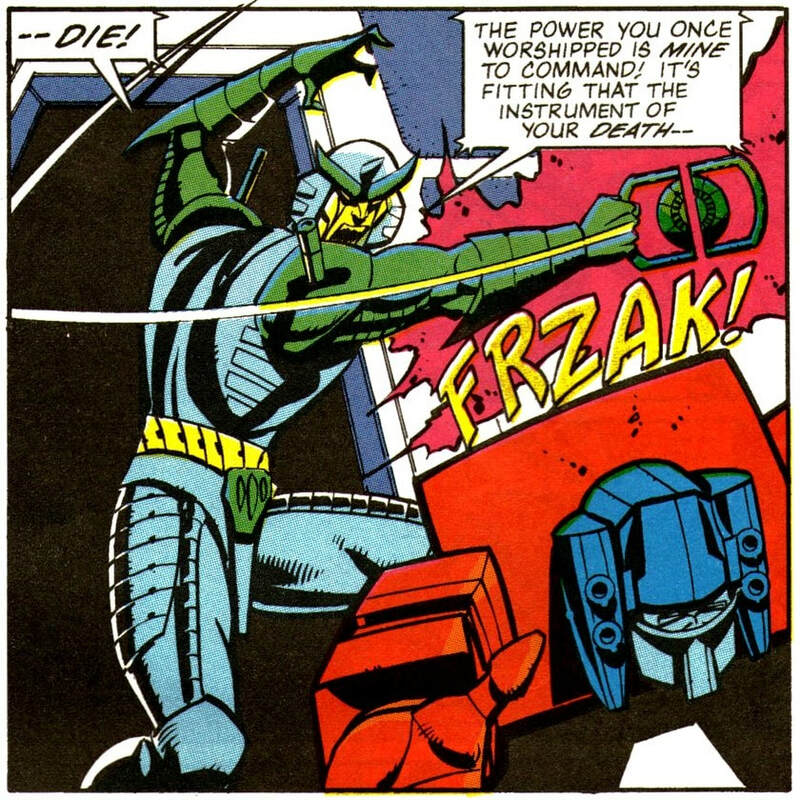 Thunderwing has the Matrix—effectively the soul of God in a box—and uses this extraordinarily powerful artefact as a club to slap Optimus with. There’s a paucity of ambition. There is some good potential drama in Prime not wanting his fellow Autobots to fire on Thunderwing lest it destroy the Matrix, but this leads to an inadvertently comedic sequence of Hot Rod leading a charge to “Rip him apart with our bare hands!” (Ron Friedman should have gotten royalties this week) that goes about as well as attacking a super-powered being with your fists ever does and gets Landmine killed. 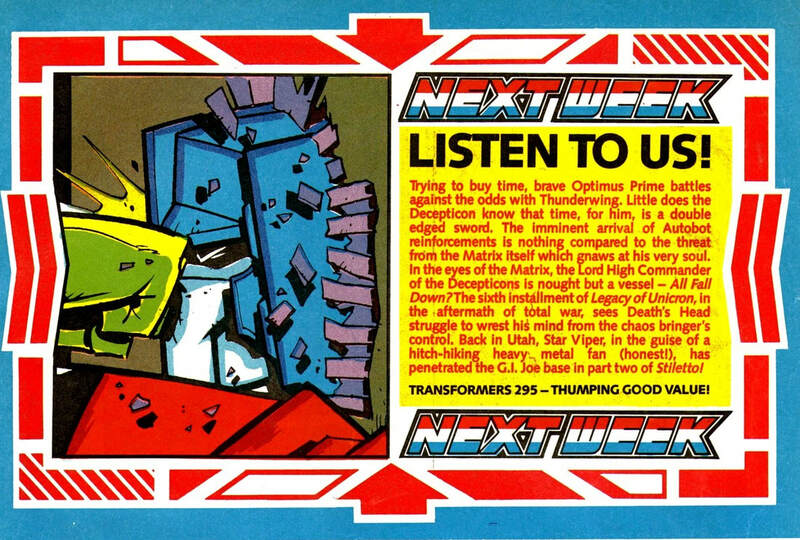 Which upsets Joyride, but presumably not Prime as he didn’t appear to know the guy’s name when he was ordering ‘Bots back two panels earlier. The issue does end with Thunderwing having upgraded his plan for the Matrix from “Blunt weapon” to “Gun”, but other than the effectively moody opening and typically fantastic Senior art (I love his Hook, Line and Sinker designs) this is rather a weak start to the conclusion of a storyline that has been running for most of the year at this point. Transformation uses its sidebar to promote fireworks safety as we approach bonfire night, plus the launch of two new comics. The first, The Complete Spider-Man, sees the web-slinger return to British newsagents and makes sense for Marvel UK to do. The second, Star Trek: The Next Generation (tying in to the much delayed launch of that series in the UK) has to be unique for the company’s output as it is actually a reprint of DC material. Don’t tell Stan Lee. The main text ends oddly with a summary of words from the rest of the intro: “And remember folks... this week’s important words are: truck, swallow, money and heel. Make mine a Nebulan old Tennessee!” A reference to a now long forgotten whisky advert? Speaking of adverts, being Halloween week we get a Fiendish Feet yoghurt competition to win various ghoulish prizes. Though it’s more of a draw really as all you have to do is send in your name to be pulled out of a hat. Combat Colin returns to black and white and actually has a go at drama. There’s only a couple of jokes (comparing limbo to Barmouth and Megabrain correcting the narrator as which issue he last appeared in) as Megabrain—real name Mensor—is found drifting through space by his people. After being mocked by the captain of the ship for his big foot holding a massive brain appearance, Megabrain uses his mental powers to swap minds and then kill his old body, before controlling the crew to head to Earth for revenge on Combat Colin! Serious stuff, but it works nicely. Dreadwind gets a letter from James Anderson of Klondyke helpfully pointing out that, despite what Dreadwind said in issue 282, Jazz was a second in command according to the Who’s Who in the second Annual. Which gets nothing but contempt from the Decepticon. Meanwhile, as if the cover wasn’t bad enough, David Grew from Linton writes in to basically smugly spoil various things from upcoming US issues (“Dare I say surrender?”) in a letter that was presumably only published because he claims with a straight face that the upcoming Galvatron is the same guy as in Perchance to Dream. G.I. Joe: The Action Force starts a new story that, after the silly politics of the last few months, is almost a relief as it’s just a straight up advert for the Strato Viper toy as he’s built by Dr. Mindbender and sent to infiltrate the Pit in disguise. The best thing about Stiletto (from issue 72 of the American comic) though is Fred and the Baroness getting jiggy with it. 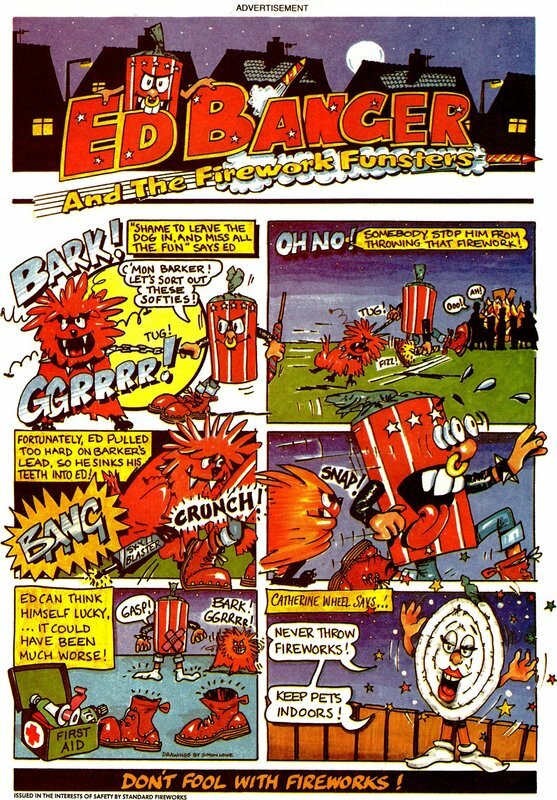 More excitingly we get a one page comic, Ed Banger and the Firework Funsters showing a firework misbehaving on bonfire night before Catherine Wheel explains what you should be doing. Remember: Don’t fool with fireworks! Next week, in 2018, Prime gets a hangover.